ART GALLERY--Janet GOLDNER Works for Sale. BIDDINGTON'S ART GALLERY--More Sculpture & Paintings. CREATIVE PROCESS visits the Tribeca studio of sculptor Janet Goldner. 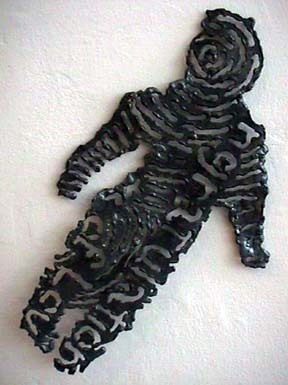 Janet GOLDNER: Cutting images and texts into steel sculptures using a welding torch as a drawing instrument, I bring together art and poetry. Janet GOLDNER: As a kid, I was always interested in social studies--in clothing and shelter. 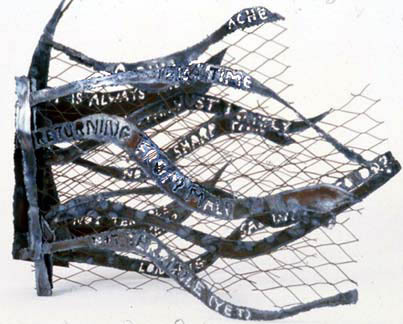 I started as a textile artist, and then I began using wire mesh and chicken wire as frames for the textiles. Eventually I became more interested in the structure than in the fabric. So, I learned welding. 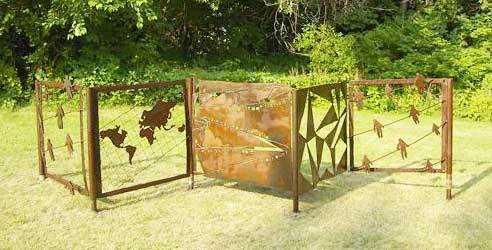 Janet GOLDNER: Some of my works are in heavy steel but others are in a very light gauge. When hanging, these light-weight tablets read almost like silk. I work in an easy rhythm with a welding torch; the hard part is deciding exactly what to say. Janet GOLDNER: Basics, wall hangings of steel tablets, offers definitions of words that underlie our political beliefs and social circumstances. Light passes through the craggy holes that form the letters. My tablets are urgent vehicles for words. Janet GOLDNER: My thirty-year cultural journey began when I first traveled to West Africa in 1973. Being born in America to two socialists at the height of the McCarthy era, I never had a chance of being in the mainstream. In Africa, I was relieved to find, (as I had suspected), that there are many ways to organize life on earth. Janet GOLDNER: Negelan is a wall installation composed of elements and iconography that have occurred in my work for many years. 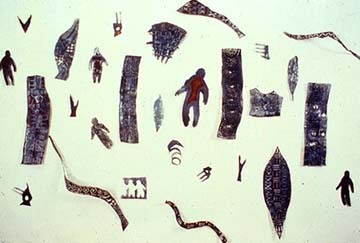 Using pieces that had not ended up in the intended sculpture, this installation developed a structure of vertical and diagonal lines and includes steel figures, feathers, hands, Y-sticks and geometric patterning. 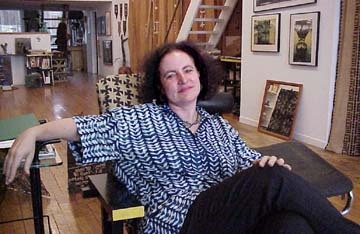 Janet GOLDNER: Since 1995, when I spent eight months in Mali as a Fulbright scholar, I have been engaged in an ongoing dialogue with Malian artists and artisans about our lives, our work and our creative process. My combining of Western and non-Western images and ideas in my own work is a result of many trips to Africa over the last 25 years. 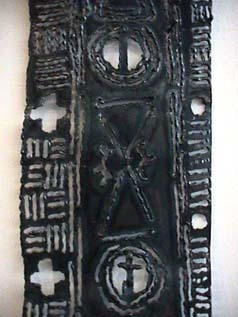 Janet GOLDNER: The hinged steel books with movable pages have grown out of my involvement with Mali. 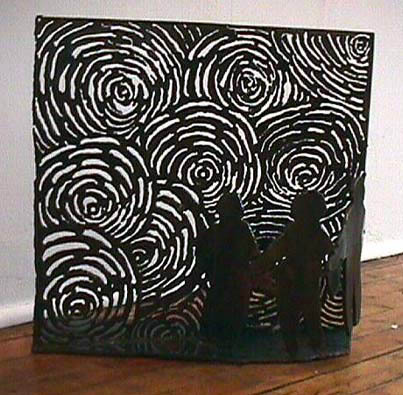 The books are layered steel collages constructed from my own scrap steel which incorporate both images and text. 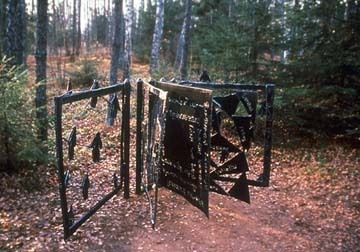 Multiple pages which are pieced and pierced by imagery and text result in varying degrees of transparency through steel. Janet GOLDNER: Each time I return to the US from Mali, I experience profound--and painful--culture shock. It is a feeling of discomfort and disorientation in an environment that is seemingly familiar. It is usually too painful to focus on; this book is an attempt to try to pay attention to the phenomenon and to investigate it. Janet GOLDNER: The books occur in a variety of scales from several inches tall up to this large outdoor piece recently installed in Lithuania. Janet GOLDNER: Can We Heal?, a 4-feet tall 5-page hinged steel book, was inspired by a trip through Poland and the Ukraine where I visited the towns my grandparents emigrated from. An outgrowth of my ongoing series of small steel books, this large-scale work asks in Lithuanian and English, "Can we heal from the wounds of our tortured history? Lithuanians, Russians, Poles, Germans, Jews, Everyone." Janet GOLDNER: My vessels resemble abstracted female torsos. In 1987, during an artist residency with the University of Georgia program in Cortona, Italy, I found myself responding to ancient Greek vessels that documented historic events. Inspired by the idea of putting history on vessels, I fabricated the first of my own vessels out of wire mesh. Gradually the vessels evolved into bronze and steel. Janet GOLDNER: A Malian potter whose utilitarian vessels hold water and food asked me what my vessels hold. "My vessels hold ideas," I said. My response deepened my understanding of the connections between my steel books and my vessels. Janet GOLDNER: This 5-vessel installation Most of Us Are Immigrants celebrates immigration as an integral and continuing part of the American experience. The work is derived from my social concerns, my community involvement and my affinity for my materials. The five 8-feet tall steel vessels which form this public sculpture weave together the experiences of immigrants across time and across ethnicity. It reflects my fundamental belief in human dignity and human rights. offered for sale in Biddington's Contemporary Art Gallery. Janet Goldner's work has been reviewed and cited in numerous publications including: New York Times, Village Voice, Newark Star Ledger, Sculpture Magazine and Public Art Review. Janet Goldner is also a frequent lecturer, panel member and artist-in-residence and is especially supportive of community art projects. CREATIVE PROCESS at Biddington's is designed as a forum for watching art in the making. Usually, this process happens in the privacy of the artist's studio. At BIDDINGTON'S Contemporary Art Gallery & upmarket, online art & antiques auction--we find it interesting to witness the steps leading to the end product and to hear the artists speak about their work in the relaxed surroundings of their own studios.